On the days of June 26th, 27th and 28th, 2009 a traditional soup festival takes place in Agnano in the province of Pisa. Visitors come to enjoy delicious Tuscan soups, tasty pasta dishes, grilled meat and the excellent Tuscan wines. Agnano, is with its six hundred inhabitants one of the smallest villages in the municipality of San Giuliano Terme. The village is situated on the slopes of the Mount Pisano midst a panoramic landscape of olive trees and Mediterranean scrub. The romantic village has its history in the Etruscan and Roman colonization. In the early Middle Ages Agnano was an important fortress of the Pisan Republic. In the middle of the fourteenth century the Archbishop of Pisa, , Giovanni Scarlatti, had the church and the monastery built. In this context, we recommend a visit to the municipality of San Giuliano Terme, which is a popular tourist destination because of its hot springs. San Giuliano offers an extensive network of routes with interesting historical villas, an aqueduct of the Medici family, a magnificent natural park of 24,000 hectares and a remarkable religious architecture from Romanesque churches and medieval chapels and monasteries. 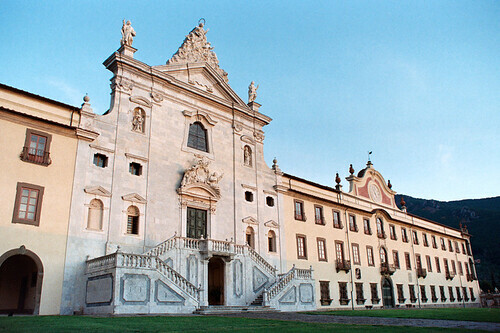 We also suggest a visit to the nearby Carthusian monastery of Calci. For accommodation, we recommend our farms where you can enjoy the famous Tuscan cuisine and the top wines.